Depending upon a baker’s region of residence, he or she might make a different version of Pão de Ló, a traditional Portuguese spongecake. In Ovar, a coastal city north of the district capital, Aveiro, bakeries are known for their particularly superlative iteration. Confectionaries sell the sweet wrapped in white paper that delicately holds everything together, but attempting to cut a slice of Ovar’s Pão de Ló is a rookie move. Diners will discover a cake center so oozy that a spoon is usually required. Made in a clay pot using just three ingredients—egg, sugar, and flour—Ovar’s signature cake resembles something between a melty soufflé and a baked pudding. Tasters describe the finished product as rich and gooey, with a delicate top-crust akin to a crisp meringue. 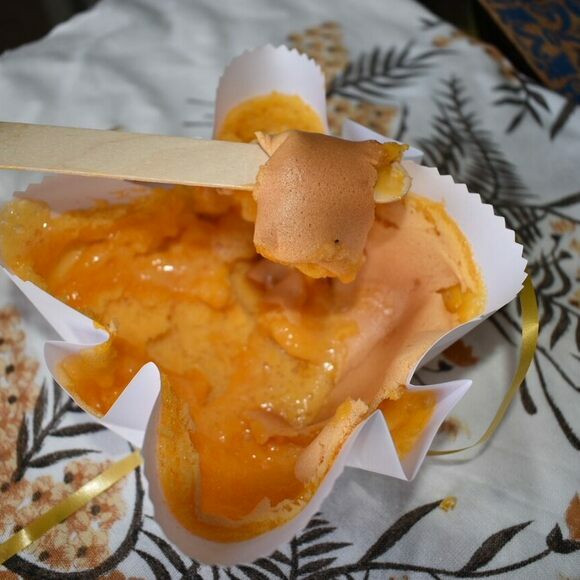 Like many of Portugal’s egg-based confections, Pão de Ló de Ovar is thought to have originated in a convent, and an 18th-century author mentions it in a book on local places of worship. Fandom has continued steadily into the 21st century, and the sweet is now registered with Protected Geographical Indication by the European Union. Since 2011, locals in Ovar have thrown a five-day summer festival in honor of their Pão de Ló. Celebrants gather to sample cakes from more than a dozen producers, enjoy live music, and dance in the city’s riverside park. You can find Pão de Ló de Ovar sold in bakeries around the region. Expect to see a party-sized serving on the table at family gatherings during festivities and holidays. This specialty bakery also sells another egg yolk sweet, called Ovos Moles, from the nearby city of Aveiro. A flour made from orchid roots makes for a popular Turkish drink. A squid's body becomes an edible sake decanter.